Remember the Windsurfer One Design (affectionately known as the Wally down under? The board that's old enough to have kids in middle school? It lives on and they've just had the National Championships in Australia where it's still a thing. The forward half of the board is double concave and it flattens out on the aft half. The design spec was to create a board that handles like the Windsurfer and can be used as an SUP. Another interesting intention is that the board will become a common “white” board to be branded differently in other countries, ie decked out with different graphics and rigs. The board looks super interesting and affordable if we didn't live halfway around the world. We ran across this remarkable photo of Lake Garda that Barrett Walker took a few years ago while skimming the front page. 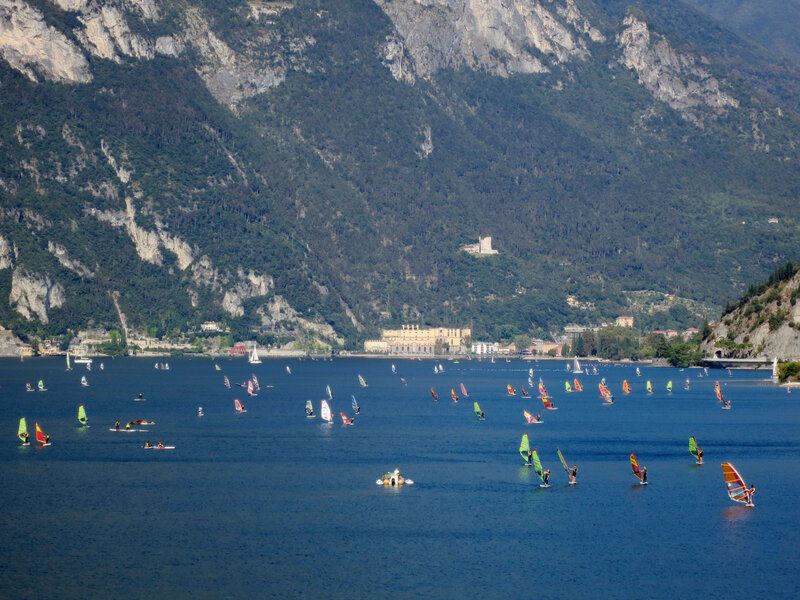 We were struck by the countless windsurfers in the photo during a quiet time of the day on the lake which is famous for its winds which blow strongly in one direction in the morning and then reverse in the afternoon. Barrett was nice enough to send us a full size image because it's aspect ration will fit nicely as a banner at the top of the web site. As we looked over the photo, we though we recognized a familiar face. Could it be? 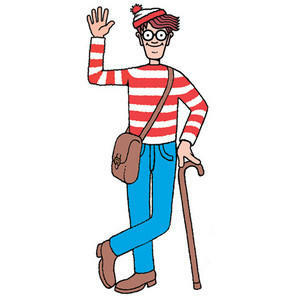 Waldo? Click below for the full size image (neither one above are large enough to find him). Zoom in, take a look around and see if you see him. You'll have to look carefully because, being out on the water, he's wearing a lifejacket and without a hat. We hope this makes another snow day without windsurfing a little more interesting. We've just finished up a project that we've been tinkering with the last few months. A bit like Area 51, this explains the sometimes weird formatting you might have encountered recently as we experimented under deep secrecy. Not even our cockatiel was aware of what was going on (which is good since we don't have a bird). Since the last major revision to the website a few years back, it's been relatively mobile device friendly. Relatively. There were some things that probably could have been done better but at least google didn't complain when we did mobile tests on their search console we use. However, we came across something neat on windguru.cz, a site we link under forecasts: a tutorial on how to "appify" a website, ie turn a website into a mobile app. Inspired, we've generated a special page you can go to and use for your "windsportatlanta.com" app. However, if you prefer, you can turn the regular home page into an app by the same process. What's different about our "app" page? We've slimmed down the front page from slides into one page of the sections you'll probably use most. In addition, we've added some icons to help you refresh and guide you to the home page. These icons only appear on smaller screens - the desktop version looks just the same as the rest of the site. You must refresh the page to see new content. We experimented with a number of ways to autorefresh but it adds traffic to either/both your phone and our server. We've opted to save your battery and our bandwidth so just touch the refresh icon in the menu bar to see any updates. Next, go to our "To Go" page on your mobile device which you can then turn into your app using the above steps: windsportatlanta.com "on the go". Of course, if you prefer, you can turn the home page or any other page into an app as well. Click the browser menu button.